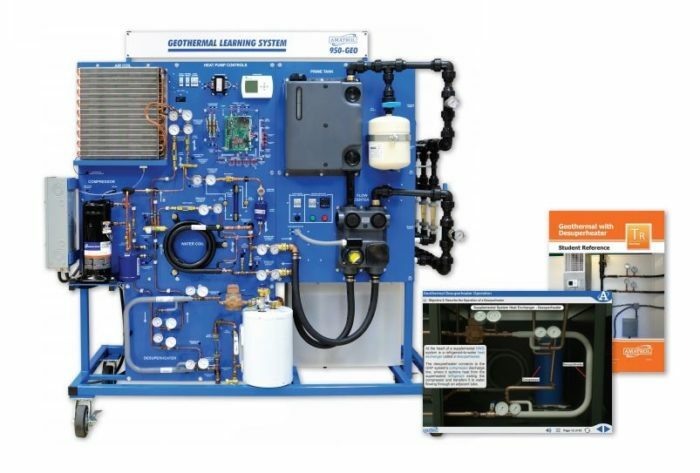 Amatrol’s Geothermal Learning System with Desuperheater (950-GEO1D) teaches learners a wide range of knowledge and hands-on skills related to geothermal systems in both residential and commercial applications. Topics range from geothermal system startup and operation to shut down and maintenance. The system features real-world components, often not visible in actual installations, on a vertical panel that permits easy access for hands-on skills and observation. This geothermal training system includes a geothermal desuperheater, which is used to heat water for little or no additional cost. The system also features a ground simulator, so that learners gain practical experience using a realistic, continuously-operational system. Other major components include a 2-stage compressor with a 2-ton heat pump, air duct with ECM blower, ground source loop, and industrial-grade geothermal controller. Amatrol’s geothermal training system features real-world components commonly found in installed geothermal systems. These include a 2-stage compressor, 2-ton heat pump, ground source loop, variable speed ECM air blower, water coil heat exchanger, electrical test points, and high-density polyethylene pipe. These components are mounted for easy observation on a vertical panel, allowing learners to evaluate system operation and performance. The geothermal training system also contains a desuperheater and ground simulator, two features often excluded from other training systems. The system teaches learners about desuperheater operation, startup, shutdown, and maintenance. The custom-designed ground simulator acts as a realistic heat source/sink that creates a sustained, temperature-controlled environment that accurately replicates the constant temperature found underground. This allows the system to deliver consistent, accurate data collection, replicating real-world conditions for training. Amatrol’s geothermal training curriculum features a highly-interactive, multimedia format that includes stunning 3D graphics and videos, voiceovers of all text, and interactive quizzes and exercises designed to appeal to learners with different learning styles. The curriculum teaches learners the basics of geothermal heat pump systems and then moves on to more advanced concepts and components, such as closed-loop circuits, compressors, condensers, evaporators, refrigerants, suction line accumulators, moisture indicators, thermostats, and desuperheater operation. The combination of theoretical knowledge and hands-on skills solidifies understanding and creates a strong basis for pursuing more advanced skills. The curriculum also provides learners with a solid foundation for pursuing an International Ground Source Heat Pump Association (IGSHPA) certification. A sample copy of the geothermal training Student Reference Guide is also included with the system for your evaluation. Sourced from the system’s curriculum, the Student Reference Guide takes the entire series’ technical content contained in the learning objectives and combines them into one perfectly-bound book. Student Reference Guides supplement this course by providing a condensed, inexpensive reference tool that learners will find invaluable once they finish their training, making it the perfect course takeaway.